One bite of this Copycat In-N-Out Vegan Burger with Spread will have anyone questioning its authenticity. The mayo-free spread paired with grilled onions even had me fooled. 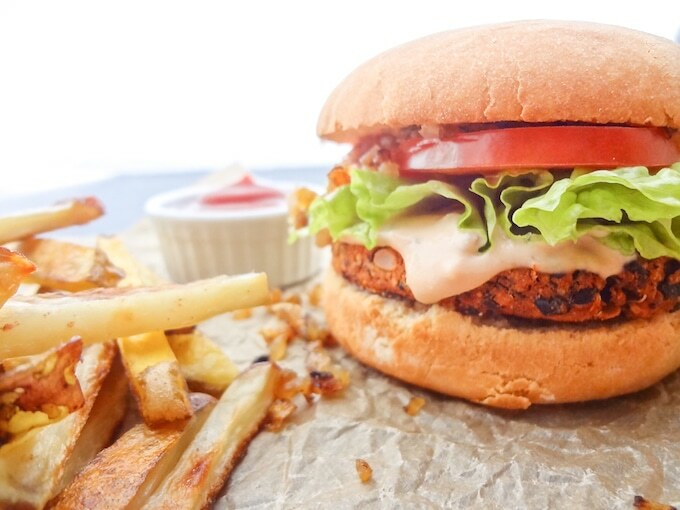 So beat that chemical burger craving with this healthier, cruelty-free option. Growing up in So. Cal. there was an In-N-Out Burger right down the street. For anyone unfamiliar with In-N-Out, it’s a fast food burger joint with only a few items on the menu and always a long line at the drive-thru. The locations were once limited to only California, but now there are locations in a few other states as well. In my teen years I would frequently enjoy a grilled cheese with grilled onions and a boat of fries –with plenty of ketchup and powdered salt. And don’t forget the spread! I always made sure to order extra packets on the side. I would slather it on every bite of the sandwich, not even the fries could escape the spread. My favorite part of an In-N-Out sandwich had to be the grilled onions paired with the spread. I enjoyed it so much that the first few months of being vegan I still found myself in the drive-thru ordering a bun with grilled onions, lettuce, and tomatoes. The confused look on the employees face was always priceless. And their questions of disbelief didn’t stop me. I would then take the sandwich home and proceed to create my own sauce with a vegan mayo, ketchup and relish. It only lasted a few months before my family and I completely cut out all restaurant/fast food and began eating only at home. That’s when this amazing ‘copycat’ burger was born! As you know, not that long ago I posted my No Crumble Black Bean Burger. Since then I’ve been thinking of other ways to enjoy my current love of these vegan patties. A few days ago my husband questioned my ability to make a replica In-N-Out spread. After some thinking, into the kitchen I went… and this magical memory was created! This Copycat In-N-Out Vegan Burger with Spread was sooo sinfully delicious! I couldn’t believe how authentic the flavors were. And the mayo-free spread was exactly what I was looking for. It was sweet, savory and tangy! 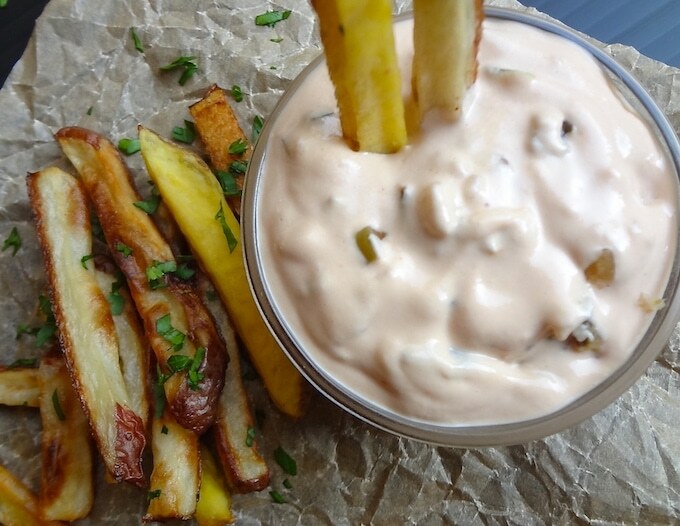 A perfect dip for the baked thin-cut fries! I suggest prepping the spread first to give it time to chill in the fridge. Add your presoaked cashews along with the next 6 ingredients to a high speed blender or nutribullet. (leaving out the relish, that will be added after blending). Stir in the relish and place in the fridge to chill for 30 min. Taste and adjust ketchup and relish. If needed, add more almond milk to thin. Prepare and cook your patties according to their directions. For an authentic patty, add mustard to one side and place that side down on the pan. Spread mustard on the other side of the patty before flipping. While the patties are cooking, grill the onions (directions below) and prep the veggies: wash and prep the lettuce and slice the tomato. Preheat your oven to 400º. Then toast the buns by lining a baking sheet with parchment paper and place the buns cut side down. Toast for about 5 min or until browned to your liking. Add about 1/4 teaspoon refined coconut oil to a pan or skillet along with the chopped onion. Grill over medium-high heat until browned and caramelized, about 10-15 min. Stir frequently and lower the heat if needed. Place your patty on the toasted bun. Add spread, lettuce, tomato and grilled onions. Serve with a side of thin cut, baked fries and of course extra spread. After a flop attempt on my part with the BBQ ranch, I had an idea. And this one mentioned what I was thinking! I made this in our Nutri Ninja (basically the Nutri Bullet) and it worked out like a dream! Now I know what do when making sauces. This one turned out great! I might dial the ketchup back a smidge next time however. Still a nice sauce! Awesome! I'm glad this recipe worked out. A high speed blender is definitely the key to a creamy dressing/sauce. Thanks so my for all your great feedback, Nathan! You can try to replace the cashews with sunflower seeds, but it will yield a slightly different taste. You can also try a vegan mayo. Replace the cashews and non-dairy milk with 1 cup of mayo. THIS TURNED OUT PERFECTTTTT! We moved to Italy from California and I constantly crave In N Out but of course as a vegan that's not attainable.. so thank you for giving me my favorite food back to me!! That's awesome to hear Hope! I'm so glad you're able to enjoy this vegan version! Wow, I'm blown away by this spread! It tastes exactly how I remember the sauce at In-n-Out, which I had plenty of growing up in California. Gonna use this to make animal style veggie burgers and fries, thank you!! 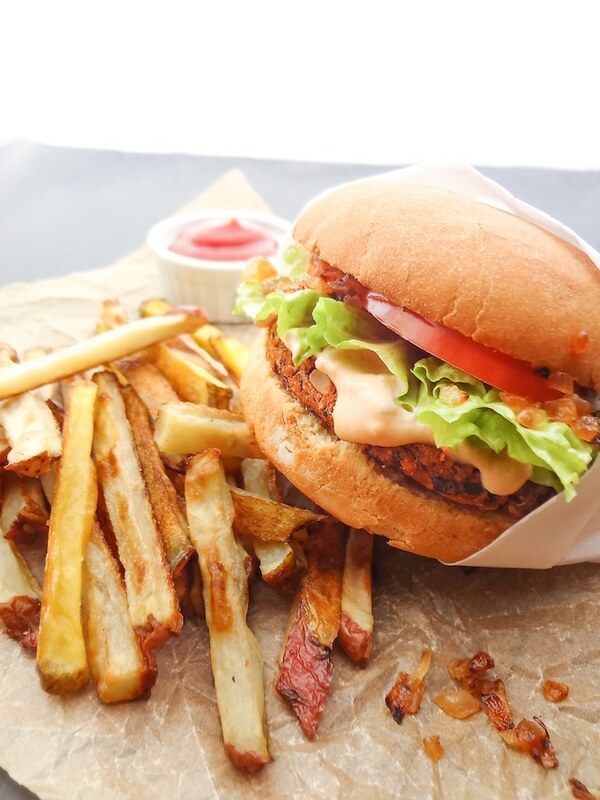 Animal style veggie burger and fries sounds ah-mazing! I'm so glad you enjoyed the recipe! LOVE this recipe! Just devoured it tonight!! Thank you! One question.... what is that bun? 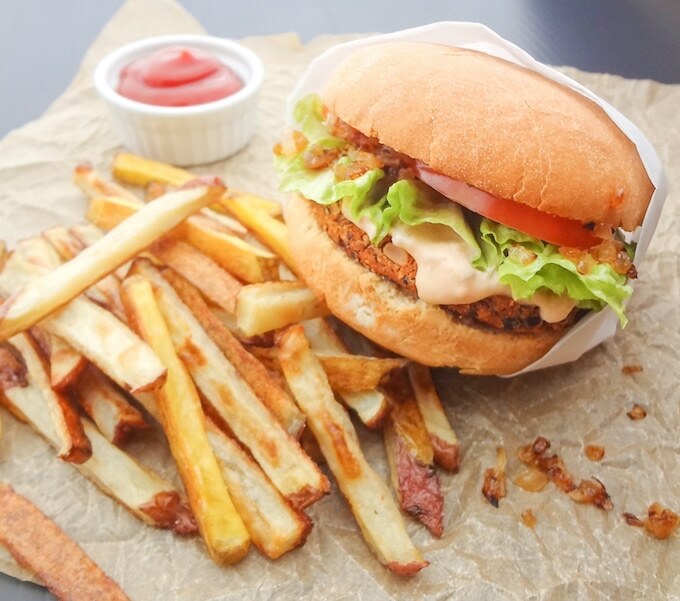 We eat/cook aoil-free vegan and would love to know if the bun is made or purchased! Again, thank you so much! Awesome recipe! This looks and sounds delicious. I can't wait to try it. I'm pinnin git. Hi Can I use a gluten free flour to replace the oat flour? Gluten-free flour should work just fine. You can also try fine ground cornmeal as well. Enjoy, Sally!! I feel bad that I've been using this recipe for months and have never left a message. I make these once a week for my family and we LOVE them! The sauce is amazing and spot on. Even better than the original. Anyway, thanks for making our tummies really happy. My favorite recipe, hands down. This looks absolutely delicious! I definitely want to try it because my boyfriend and I have been craving in n out for awhile now. I'm vegan and he's vegetarian. However, I am allergic to some types of nuts, cashews included. So I was wondering if there was a way to sub for this, or be able to leave it out altogether? 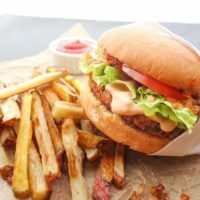 These vegan replicas of In-N-Out burgers are insane! I use to enjoy them back in my teen years too. The best part was the fresh lettuce, tomato, onion and dressing. Now I will be making these and sharing the love!! I heard a rumor a while ago that In-N-Out was considering a veg burger. If we want to see it happen, we have to use our voices. I suggest writing to them a brief "Please add a good vegan burger and dressing to the menu." 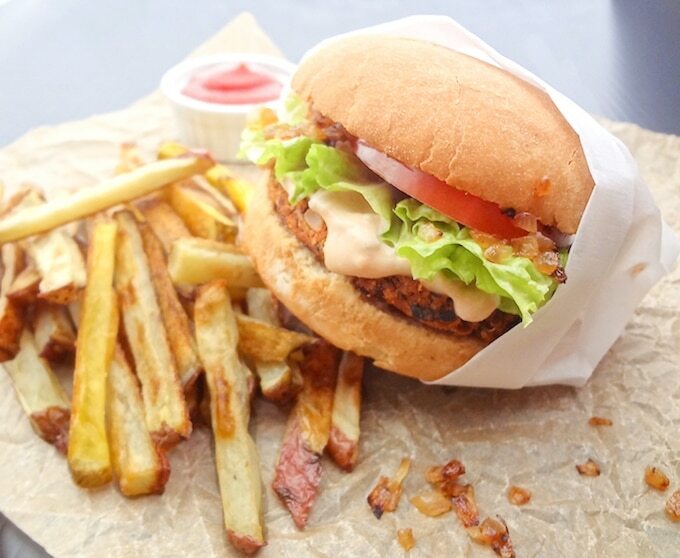 It could make a difference as other fast food places are adding a veg burger to their menus. We have to keep asking and this gets the ball rolling. This looks awesome! You are not alone, I have also ordered lettuce, tomato, and grilled onion at in n out! Nice to know I'm not alone! :) Now I can just make this when I'm craving In-N-Out! This burger is DELICIOUS ! Pretty easy to make, (I made my patties ahead of time and kept in the fridge about 11-6:30), and made some homemade buns as well. SERIOUSLY, you gotta taste this burger. These burgers were delicious! Better than the original not to mention healthier! Thank you for this wonderful creation! Made these last night along with your baked seasoned fries. SOOOO GOOD! The sauce was amazing and so happy it is mayo and oil free. I made it as is and after sitting in the fridge, it thickened up perfectly. The burgers were great and so happy to have them not crumble everywhere. Just amazing and had to be the best vegan burgers we have ever had! Definitely will be making these again! Thank you so much for the recipe, I cannot wait to try it. I have an In and Out Burger near my house but stopped eating meat 3 years ago, so now I just order a In and Out Burger with only cheese and no meat and add all the extras (tomatoes, pickles, special sauce, lettuce, grilled onions) and it fulfills that craving. Your recipe adds more protein, which I like, and just sounds delicious! Made this tonight, it was really good. I added in more relish and some mustard as well, I may omit or at least reduce the almond milk next time so that it is thicker. Thanks for the great mayo free recipe.